To start your autumn travels off right, we are giving away this classy Hadaki City Duffel bag – valued at $199.95! 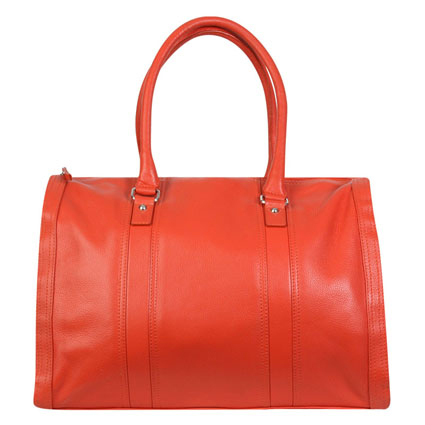 This luscious all-leather bag features accent stitching, sturdy hardware, and an orderly interior. One winner will be announced on Tuesday, September 9th at 9:00am MDT. I start with a packing list. I put together outfits that complement each other so as to minimize clothing I need to pack. I keep a list of items I regularly need like toiletries so I don\’t have to think about forgetting anything. Lots of lists, wake up early, and star with a hot cup of tea. One bag for undergarments and another for most everything else. I also try to pack clothes that will work well for multiple combinations, such as one color shirts and pants. My carry-on contains my computer items and other things that I use the most often or can be lost it stolen easily. Once I get everything packed, I make sure I put everything back in its place immediately after I use it. It can be really difficult to stay organized when you travel. I always know what I need to have with me, but sometimes it\’s more than I should really be taking or can even carry. So I narrow it down to what I can fit in my tote bag and take nothing more than that. By having an awesome bag like the Classy City Duffel that holds all my \’must haves\’ like my FC planner, iPhone and make-up bag!!! I always ask myself what will I need and when. For my purse..while on the road are the essentials where I can grab them without looking. For my travel bag …what time will get there and what will I want get a hold of first. I had the miracle of winning a trip to Denmark which will allow my fulfilling both a dream and a promise to my grandmother and mother, to get to the country of their birth and all of my maternal ancestry. This bag would be so perfect since I need to travel light due to health concerns. And, it is orangey red, perfect for me. Make sure to take my planner. I pack light – so no extras or just-in case items. I plan what I am wearing each day that I\’ll be gone – and I stick to it! Using a smaller travel bag helps stay on task by not giving me the sense that I have space to fill. I bring clothes that are in one color family, usually black and white. That way I can bring fewer clothes and mix and match. Plus, fewer shoes! I stay organized while traveling by preparing before the trip. I print out all confirmation emails and itineraries, place them in a plastic folder by order of anticipated use. As I complete one portion of the trip or check in process, I place that sheet at the back of my stack. This way I never shuffle through papers at any counters. I always carry a notebook with me to jot notes, directions, and usually to clarify information with locals. We may not understand each other\’s speech but once we put pen to paper it is always easier to understand one another. And lastly i use a travel journal at the end of the day to record my memories and observations, making my recall of the trip more organized when I finally get around to making a scrapbook. I have used the Franklin Planner for at least 30 years. I have small light net bag within larger bag to put things in that i won\’t need to look at until i get home, then they are out of the way and don\’t interfere with the things i need now! Congrats livivua – you are our winner! Please email [email protected] with your physical address, so that we can send you the bag! I keep things in baggies so that they stay separate and folded! When I travel I put everything in compartments in bags and put things back how I pack them after I use them so my \”stuff\” stays clutter free. I put my outfits together along with jewelry, undergarments and socks, note which shoes to wear. I do the same for the children and each day in a zip lock bag with their name on it. Ziploc bags and zipped pencil cases. My husband makes fun of me, but it keeps everything in place.